The holy city of Teotihuacan ('the place where the gods were created') is situated 48 km north-east of Mexico City and is one of the oldest archaeological sites in Mexico as well as one of the most spectacular in the country and even the world. It was built between the 1st and 7th centuries AD and is thought to be Mexico's largest ancient city and capital to the biggest pre-Hispanic empire. At its peak it was home to over 100,000 people but had been abandoned long before the Spanish invasion which saved it from destruction. Teotihuacan contains two huge and spectacular pyramids, the Pyramids of the Sun and the Moon, the former of which is the third largest in the world after Cheops in Egypt and the overgrown Cholula near Mexico City. You can climb up part of the Pyramid of the Moon to get a great vista down the eerily-named Avenue of the Dead, lined with numerous smaller structures. The climb up the full 250 steps of the Pyramid of the Sun gives a superb panoramic view of the whole site and surrounding countryside. 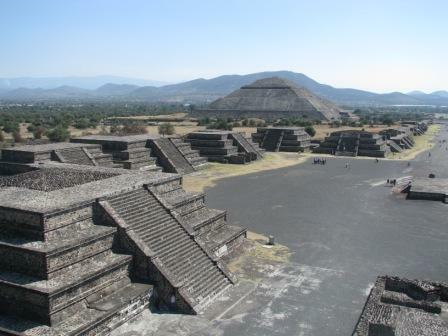 Organised group tours: Click here to see 5 tours to Mexico which may include Archaeological Site of Teotihuacan.